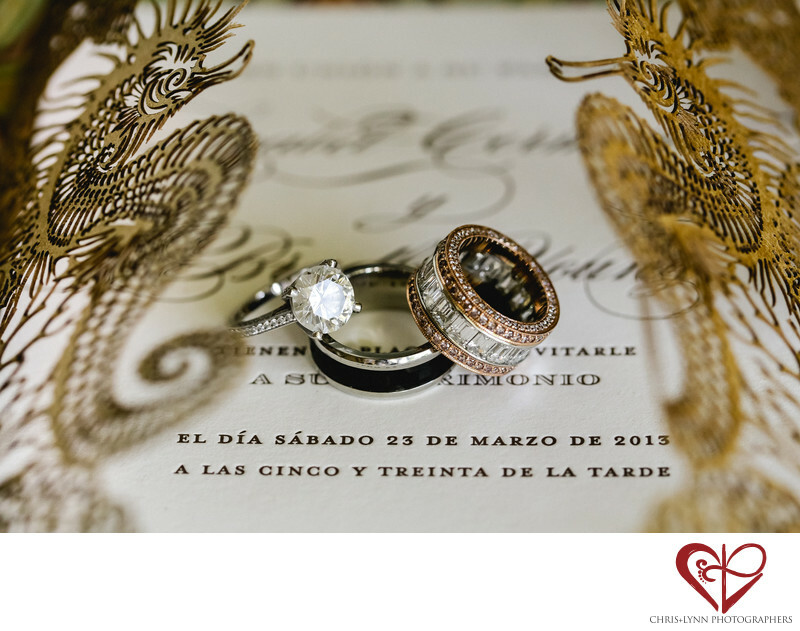 This Chicago couple had guests from the USA, Brazil, and Spain coming to their destination wedding in Mexico. Their custom invitations came in an English and Spanish version and featured intricate laser cut patterns of golden fish and seahorses. The result is one of the most unique wedding invitations we have ever seen. They reflected the couple's concept for an luxurious Los Cabos beach wedding and were the perfect backdrop for the photo of their engagement ring and wedding bands. Chris shot this image with the Canon EF 100mm f2.8 Image Stabilized USM Macro lens. The 100mm 2.8 is the best lens for shooting 'getting ready' details such as invitations, wedding and engagement rings, earrings, necklaces and other jewelry due to its 1:1 magnification and 12" minimum focusing distance. "The pristine property singularly demonstrates why it’s both the best resort in Mexico and one of the most exclusive escapes on Earth. Perched in an idyllic enclave at the southernmost point of Baja California, with unrivaled views of the Pacific Ocean and the Sea of Cortez, it artfully combines a distinct sense of place and provenance (it was originally built in 1956 as a 15-room hideaway by the son of the then-president of Mexico, and hosted guests like John Wayne and Lucille Ball) with flawless service and countless amenities that have A-list celebrities and luxury travel enthusiasts alike again flocking south of the border." 1/250; f/5.0; ISO 800; 100.0 mm.